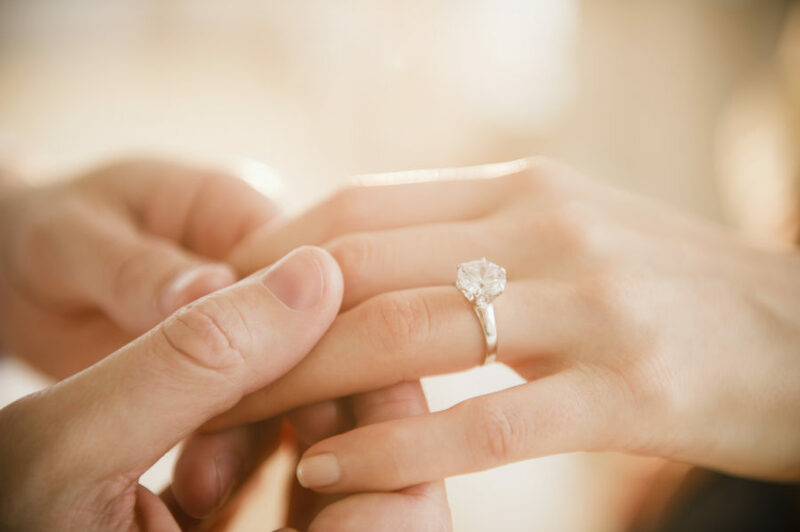 When you think of engagement rings, a few words may come to mind: Oval, cushion, princess, pear, heirloom, asscher (oh, and perhaps an image of your partner or fantasy suitor). Chances are, the phrase “upside down” doesn’t pop up into your thought bubbles when you’re pondering one of the most important jewelry pieces in your life. Until now. The curveball trend has been popping up all over social media with upside down engagement rings ranging in price from a few hundred dollars to a home down payment. As PureWow recently reported, the flipped-around style has been gaining traction and appearing in glossy magazines and instagram streams alike. The actual styles vary significantly with some rings being a simple riff on a traditional pear-cut gem in reverse, and others featuring a rotated whirl of diamond clusters beneath a larger rock. Even if you’re not in the market for an engagement ring, the trend can still be a fun shuffle on a band’s traditional composition. An upside down turquoise stone with some fine silver embellishments? Sounds lovely. How about a simple geometric jet and lemon quartz combo in reverse? It certainly could be a fun style statement. But if an upside down engagement ring floats onto your finger anytime soon, let us not forget the inevitable stream of Southern grandmas prompting you to flip your stunner—amidst all those oohs and ahhs, we hope.